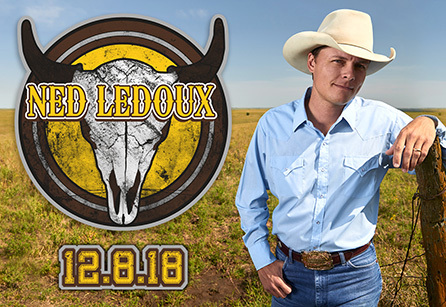 Head on up to the DeJoria Center for a night of country music when Ned LeDoux performs live December 8th! In country music, a last name like LeDoux casts a big, storied and bittersweet shadow, but it’s one Ned LeDoux doesn’t mind standing in one bit. Having been a drummer in his dad Chris’ band Western Underground since 1998, Ned knew from an early age that he had “no plan b” but to play music. “Once I got the taste of the road, and being in front of a crowd and just the sound of it, it was…freedom.” On tour, you’re guaranteed to hear “This Cowboy’s Hat” the song most requested by his fans and a request Ned is honored to oblige. His personal favorite song to sing though is one called “We Ain’t Got It All.” It’s the first original song Ned co-wrote with his dad and seems to pick up right where Chris left off. And with his debut album “Sagebrush” available now, there is a new voice to carry on the LeDoux sound.